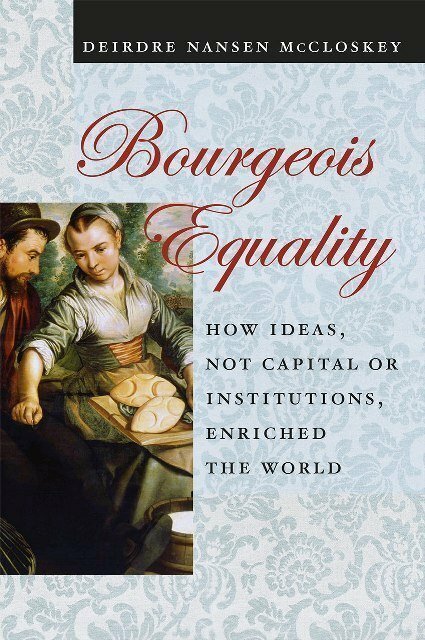 Bourgeois Equality; How Ideas, Not Capital or Institutions, Enriched the World (2016) | Moral Markets? There’s little doubt that most humans today are better off than their forebears. Stunningly so, the economist and historian Deirdre McCloskey argues in Bourgeois Equality, the concluding volume of her trilogy celebrating the oft-derided virtues of the bourgeoisie. The poorest of humanity, McCloskey shows, will soon be joining the comparative riches of Japan and Sweden and Botswana. Why? Most economists—from Adam Smith and Karl Marx to Thomas Piketty—say the Great Enrichment since 1800 came from accumulated capital. McCloskey disagrees, fiercely. “Our riches,” she argues, “were made not by piling brick on brick, bank balance on bank balance, but by piling idea on idea.” Capital was necessary, but so was the presence of oxygen. It was ideas, not matter, that drove “trade-tested betterment.” Nor were institutions the drivers. The World Bank orthodoxy of “add institutions and stir” doesn’t work, and didn’t. McCloskey builds a powerful case for the initiating role of ideas—ideas for electric motors and free elections, of course, but more deeply the bizarre and liberal ideas of equal liberty and dignity for ordinary folk. Liberalism arose from theological and political revolutions in northwest Europe, yielding a unique respect for betterment and its practitioners, and upending ancient hierarchies. Commoners were encouraged to have a go, and the bourgeoisie took up the Bourgeois Deal, and we were all enriched. Few economists or historians write like McCloskey—her ability to invest the facts of economic history with the urgency of a novel, or of a leading case at law, is unmatched. She summarizes modern economics and modern economic history with verve and lucidity, yet sees through to the really big scientific conclusion. Not matter, but ideas. Big books don’t come any more ambitious, or captivating, than Bourgeois Equality. 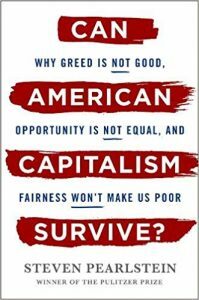 "... the fear that automation will destroy jobs and exacerbate inequality. Instead, she argues, “The work we do will be more and more about decisions and persuading others to agree, changing minds, and less and less about implementation by hand.” Besides, she argues, inequality of incomes does not matter as long as the “condition of the working class”, or the poorest in society, improves. This is oddly complacent, given the role inequality plays in the present distrust of business and the tide of populism McCloskey warns about. She does not make much effort to stand up her argument that automation will change the character of work rather than simply destroy it [...] Bourgeois Equality is on stronger ground looking back than forward. It suffers from some repetition and an overdone archness of tone. 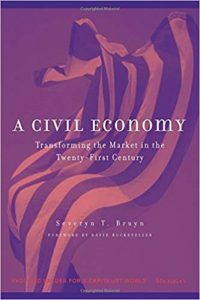 But it is richly detailed and erudite, and it will join its companion volumes as essential reading on the industrial revolution, as well as a model of the intellectual depth and breadth achievable through the study of economics." "This book, and the two that precede it in the now-complete trilogy, work with the argument that economics is founded on metaphor, language and argument, despite its practitioners’ claims to represent reality through equations leading to mathematical proofs. [...] Rhetoric is the underpinning of the book’s structure, purpose and argument, it is central to the theorizing, and its practice here communicates the ideas that McCloskey claims have changed the world and how we live in the last two hundred years. [...] The substantive argument is simultaneously transparent, easy to follow, and obscurely difficult to grasp. [...] What, or who, is the argument for? 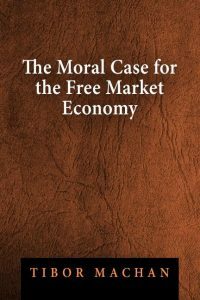 Its creator tells us it is in the tradition of, first and foremost, the ‘Blessed Adam Smith’, then Veblen, Keynes, Gramsci, Galbraith, Hirschman, Sen and Ostrom, all economists who take the position that economic agents are in fact people who practise virtues. Evidence and theory are presented from a range of disciplines (e.g. social history, economics, politics, literature, art history, philosophy) in a variety of forms. The narrative also takes in most of what everyone else has said or written about post-Industrial Revolution political economy, sometimes dismissively. [...] McCloskey’s social and economic libertarianism are more prominent, more clearly articulated, here than in previous books." 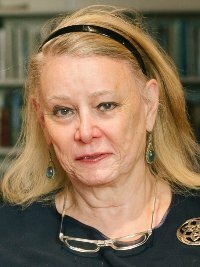 From her own website: "Deirdre McCloskey taught at the University of Illinois at Chicago from 2000 to 2015 in economics, history, English, and communication. A well-known economist and historian and rhetorician, she has written 17 books and around 400 scholarly pieces on topics ranging from technical economics and statistical theory to transgender advocacy and the ethics of the bourgeois virtues. She is known as a “conservative” economist, Chicago-School style (she taught in the Economics Department there from 1968 to 1980, and in History), but protests that “I’m a literary, quantitative, postmodern, free-market, progressive-Episcopalian, Midwestern woman from Boston who was once a man. Not ‘conservative’! I’m a Christian libertarian.”"
First Question; What Is to Be Explained? Second Question; Why Not the Conventional Explanations? Third Question; What, Then, Explains the Enrichment? Fourth Question; What Are the Dangers?